* The Britains JCB 3CX Backhoe Loader will puts its back - and front - into any heavy-duty construction project. 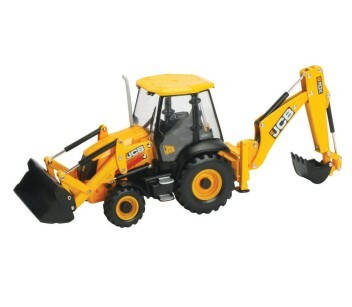 * The digger has an enclosed driver's cab, big tread tyres, superb interior detail and working steering wheel. * The front loader raises and lowers hydraulically with the pivoting bucket able to tilt forward and back. * The rear backhoe swivels through 180 degrees and can slide from side to side along a parallel rail. * Hydraulic pistons raise and lower the backhoe's giant arm and tilt scoop. * Compatible with other 1:32 scale authentic replica plastic farm vehicles and machinery.